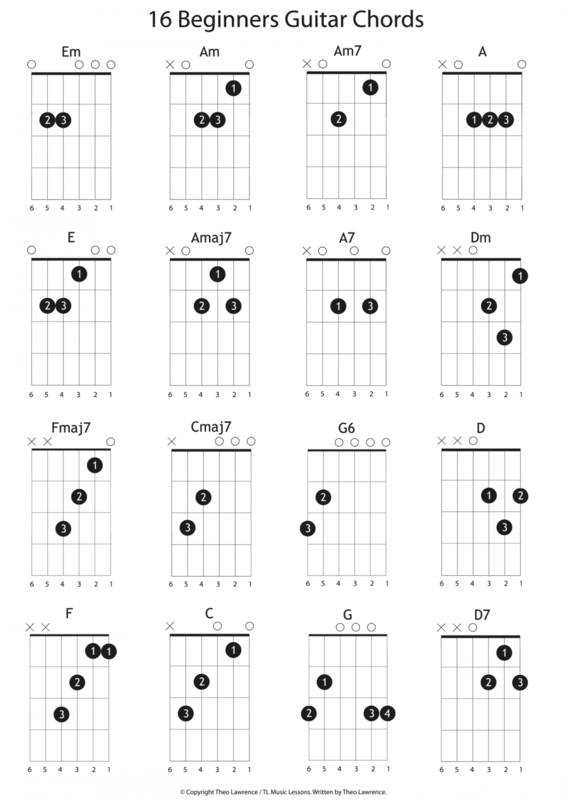 Here is a sheet of beginners open chords. It has been made using Adobe Illustrator. Here’s a quick ‘how to’ for reading the sheet. String 1 refers to the thinnest string and string 6 refers to the thickest. At first, it feels like it should be the other way around but make sure to learn and teach it this way because everywhere refers to them this way. The horizontal lines are the frets. The ‘boxes’ or ‘rows’ that this creates are what we call frets. This can be confusing because those metal bars on the fretboards are the frets, but when we say ‘play fret 3, that means to put your finger in between the 2nd and 3rd raised metal fret. The frets have been numbered 1 to 4 on the left hand side of each chord box. So, for the Em chord, you will be putting both fingers on Fret 2. One finger on string 4, fret 2, and another on string 5, fret 2. The finger numbers are inside the blacked out circles and are for a guide. You may used different fingers as preferred. The X above a string means to not strum that string. The O above a string means that you will be playing this string too even though there are no fingers pressed down on it. It’s easier though just to look for the X’s and follow those, and just ignore the O’s. The thick line at the top of the chord box is the ‘Nut’. This is usually a white plastic bit at the end of the neck where the guitar adjoins the head, which holds each string on their way through up to the tuning pegs. Strum all required strings with one swift movement to perform a chord, making sure to play the correct amount of string (look out for the X’s). For example, Em is all 6 stings, and D is only the first 4 strings. Each chord has a name, which is above the chord. anything with an ‘m’ after it is a minor chord, so Em is spoken as “E minor”. Chords with just a letter are major chords, so A is spoken as “A major”, or sometimes it is just spoken as “A”. Chords with a number after are just spoken as “A 7″ or G 6”.